The Allied Telesis AT-WNU300N provides desktop PC users or notebook users with access to high-speed wireless networks for flexibility and freedom.You are free to move your PCs within the wireless coverage anywhere your want.Using the latest IEEE 802.11n technology,the wireless connection speed can get up to 300Mbps,more than five times the throughput of the earlier traditional IEEE 802.11g standard. In addition, the wireless range is also extended,ensuring greater connectivity and coverage.Dynamic data rate scaling helps achieve the fastest possible connection within the wireless coverage area. Download official driver for Allied Telesis AT-WNU300N. 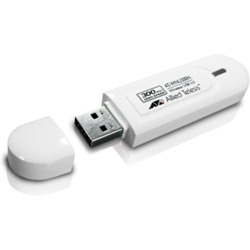 Allied Telesis AT-WNU300N 802.11n Adapter is based on the Ralink series USB Wireless LAN chipset. If you need the latest driver, try to search Ralink generic windows driver.